We're right smack in the middle of summer. Wedding season is in full gear and everything is romantic and airy. What about classic black and white? A black and white affair is always beautiful and timeless and perfect for any season! This wedding party did a black and white at its finest. The modern setting and classic attire complimented each other very well. 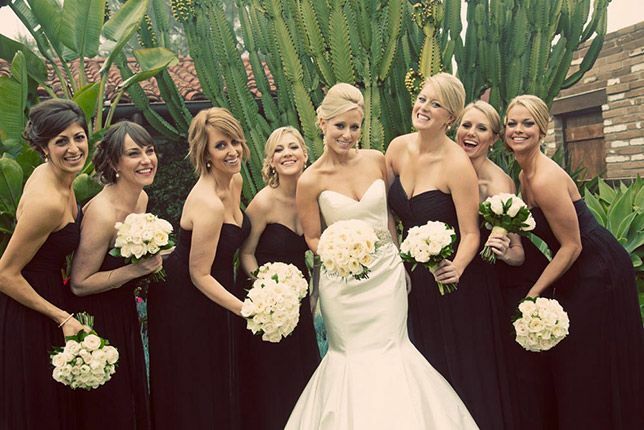 They chose to do black bridesmaids dresses as and well as black tux's which really make the bride stand out. Its very chic and modern, but still timeless. Love this look! Another great idea is having the wedding set is an outdoor venue that has structure and greenery for a pop of color to make the wedding party stand out. Carrying the black and white idea into the theme still gives off a classic vibe in a more casual setting. 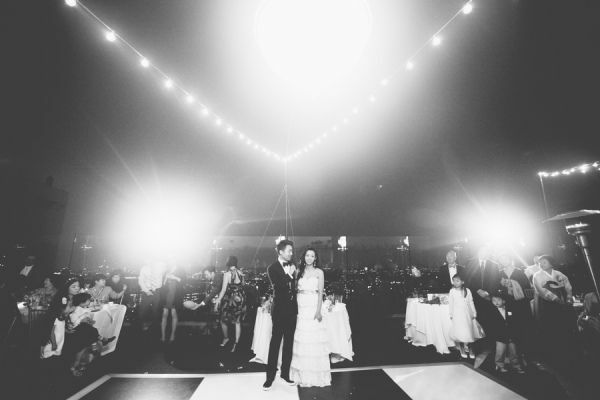 Glowing lanterns and a black and white checkered dance floor seamlessly combine the two. Family and friends can enjoy cocktails while dancing the night away to Frank Sinatra on a warm summer night!